New baby heifer out of Pearl Snap BCB! 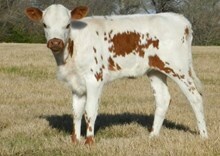 Gorgeous heifer out of Wiregrass breeding. Joe Graddy loved this cow. She is a picture perfect longhorn and a great producer.